In my travels to uncover a few tips from those that are in the trenches; however, I was pleasantly surprised to have my initial assumption challenged after visiting two SGIA member companies. 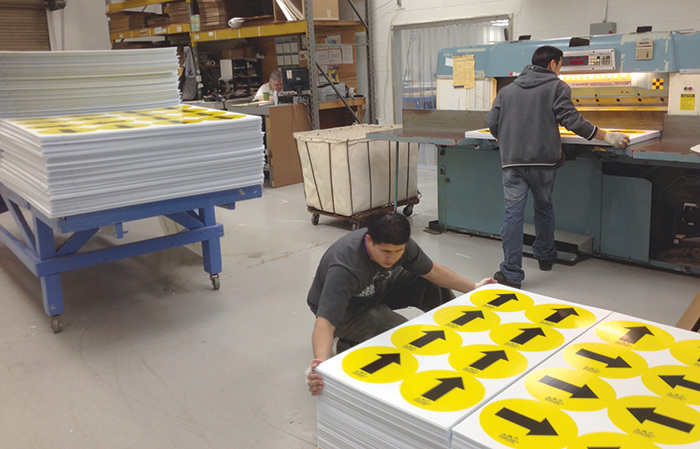 Timsco, Inc. has been in business since 1957 and offers both screen printing and digital printing services in their 40,000-square-foot facility in Temple Hills, Maryland. They have four Fuji Acuity flatbed printers, two of which are hybrid printers, and two M&R Long Stroke Press screen printers (print area on the M&R is 52 inches x 148 inches). The list of substrates that Timsco uses in their operation is quite large and includes materials such as Lexan, PVC Sintra, Coroplast, Dibond aluminum, Gator Plast, foam core, Plexiglass, and wood. Keith Prichard, Timsco’s General Manager, reminded me that when using Coroplast, it’s important to test its dyne levels upon arrival so that you can avoid printing complications that can lead to finishing problems. You can use a dyne pen to measure the surface tension, which will give you a good indicator whether or not your ink will adhere properly. During a conversation about Timsco’s substrates, Prichard challenged my finishing assumption. He told me that in some cases, Timsco will do the finishing before printing to avoid chipping ink at the edge of the product when they are cutting or routing the material. His point - a valid one, at that - is that with the ability to register and print right to the edge, you can avoid some of the chipping issues that might occur when you are cutting or routing the edge of a finished piece. One of their latest acquisitions that Timsco uses is the MultiCam Digital Express. The MultiCam handles their routing and cutting, with three heads loaded and ready to use at all times. While I was there, the machine was cutting out skateboard covers from a foam material that was being cut first and then was going back for printing. Because of the variety of work that runs through their shop, the MultiCam is just one piece in their finishing puzzle. A quick list of some of the equipment reveals a plethora of applications: A guillotine cutter (cuts large stacks of materials, though you have to watch that it doesn’t crush materials such as foam core); a table saw with Saw Stop technology (cuts wood and other hard materials - saw has a brake system that will stop the blade instantly if it encounters something soft, like a finger); a panel saw (saw can be turned to make horizontal or vertical cuts); a band saw; corner rounders; die cutting equipment for steel rule dies; and a metal puncher. Having the ability to cut or score corrugated material is also very important as prototype packaging, and even short-run production, is becoming more commonplace. The MultiCam is able to handle this material with ease, and I was fascinated to discover that some of the projects in the shop were not prototypes like I originally thought, but were instead short-run projects created entirely in his facility. The difficulty when looking to add equipment of this nature is the dust that is created when sawing or routing any hard substrate. All of Timsco’s equipment was in separate rooms with a door or hanging closure of some sort and a vacuum system to help cut down on the dust created. Most finishing equipment manufacturers will have suggestions regarding methods to keep the dust from the print shop. There is nothing worse than having a print ruined by dust in the ink or, even worse, all over the adhesive from the laminate. Prichard added that plexi is easy to chip when cutting, and so always make sure that you have a sharp blade and slow the cutter down - speed is not your friend in this situation. He reminded me again that finishing is not always the last step. Hargrove Inc. is located in Lanham, Maryland and occupies a 365,000-square-foot facility on 77 acres, just minutes from downtown Washington, DC. 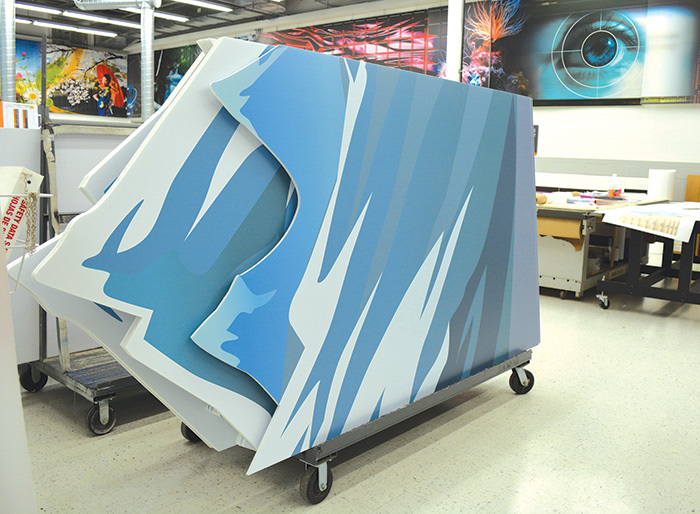 Hargrove, too, uses a wide variety of rigid substrates in their digital production environment. For printing on these substrates, they rely on their EFI VUTEk HS100 Pro (3.2 meter hybrid digital UV press). 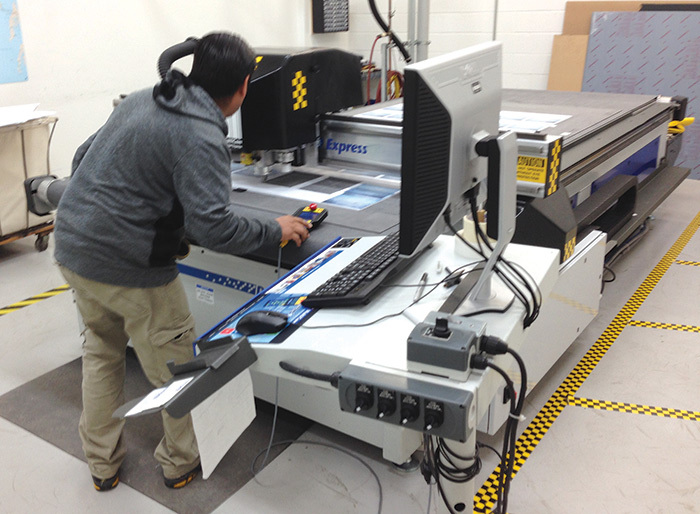 From the digital print shop, substrates that need to be cut or routed typically go to the Esko Kongsberg Multi Cut. Again, this room is separated from the printing room to cut down on dust. Here, almost all of the projects are printed first, and then cut. Richard Switts, Hargrove’s Graphics Production Supervisor, mentioned that they have learned to dial back the cut speed revolutions from their normal of 350 revolutions to 50 revolutions when they are cutting small letters for three dimensional signs - the slower revolutions and the reduced vibrations allows the material to be cut much more cleanly and keeps the need for repeats to a minimum. He also noted that when using something thin such as a 1/4-inch Sintra, it’s a good idea to use a spray adhesive to bond the material with another substrate layer, allowing them to cut through the first layer and just into the second layer. The small letters or designs will stick to the second substrate and will not chip as easily or become damaged during the cutting process. Once the cutting or routing is finished, they then separate the two layers. They also do daily “table mapping,” which is a way for the machine to get real-time updates to the exact field conditions of the cutting table. Switts noted that the 15 minutes to map the table is well worth the investment in time, as it increases the quality of the cuts. When changing knives or bits, he recommends always redoing the offset so that critical cuts are accurate. To further streamline the cutting, Hargrove Inc.’s GMG Production Suite preflight software prints coordinate dots that the cutter reads to reorient as it cuts the project. Switts found that they could reduce the number of dots the machine needed to read without compromising the accuracy of the cutting, but it did speed up the process. For the big projects or heavy-duty cutting, Hargrove Inc. uses the Pratix N15 CNC router. This router has a 20-position rear tool changer and has standard US and metric bits - the metric bits are used when the cuts need to match up to cuts made with the Kongsberg. I also spoke with Patricia Steding, Marketing Manager with Trotec Laser Inc (SGIA member since 2009) for her perspective about laser cutting and engraving devices in the finishing process. What are some applications that would require a laser over a traditional cutter/router device? Steding: Lasers are suitable for pretty much any application that traditionally required a cutter/router device. In several cases, however, a laser drastically increases efficiency and improves results. These include applications using acrylics, because a laser eliminates the need to flame polish or to perform any post processing. Lasers are also much more efficient and effective for applications that require a high level of detail and precise cuts, because lasers have a small spot size and no blade or bit, allowing it to cut a tighter radius. In addition, lasers generally include vision systems, which enable them to make intricate cuts on pre-printed materials. Small materials are also easier to process on a laser. No clamping or fixturing is necessary. What are advantages with using a laser device? Steding: Lasers offer a number of advantages over traditional methods. They are more efficient because they eliminate post-processing, require little or no maintenance, and provide faster processing speeds, allowing businesses to reduce overhead. Lasers also produce higher-quality and more detailed finishing on items due to features such as the laser spot size, vision systems and unlimited design capabilities provided by workflow software. Another advantage is that lasers are more compact, and can process a wide array of material types, shapes and sizes. How does a laser system handle applications that are printed first and then cut or engraved? Steding: There are many applications in which pre-printed material require intricate cutting to create the finished product. Laser vision systems are ideal for these applications because they allow you to create perfect cuts around the printed area, position materials accurately, and auto-correct linear and non-linear distortions. The finishing process is not a one-size-fits-all step within the imaging industry, but it is as important as the actual printing for the project itself. Whether you perform finishing steps before printing, include “smart” software or incorporate laser cutting, it’s critical to find the method that works best for your shop — and more important, for your print. Ray Weiss, Digital Imaging Specialist for SGIA, joined the Association in 2014. He provides solutions and technical information on digital printing and digital imaging issues as well as digital equipment, materials, and vendor referrals. Ray started his career in offset and digital imaging after eight years in the USAF. Ray has extensive experience with many of the major RIP software and printer manufacturers. This article appeared in the SGIA Journal, January / February 2016 Issue and is reprinted with permission. Copyright 2016 Specialty Graphic Imaging Association (www.sgia.org). All Rights Reserved.